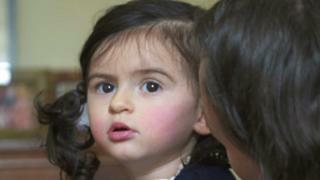 An Edinburgh mother has described her 18-month-old daughter as a "human timebomb" after being diagnosed with a one-in-a-million condition. Anya Behl is one of only two Scots with the rare illness, with only 500 cases in the world. Doctors describe it as being like having seven diseases all at once. Katherine Behl said she wakes every morning not knowing if it will be a normal day or one where her child has a life-threatening episode. Anya was born in July 2017. When she was just 10 weeks old, she had her first experience of Alternating Hemiplegia of Childhood (AHC). The condition causes "episodes" similar to epileptic seizures, but also has symptoms similar to stroke, paralysis and Parkinson's disease. The episodes can happen at any time. Mrs Behl, a doctor, told BBC Scotland's The Nine that the first one was terrifying: "At ten weeks old life just stopped. "She was in bed with us - she was loving tummy time in the mornings. Suddenly she did this terrible, really heart-wrenching scream. "We turned her over and my husband said her eyes were twitching. I had a quick look at them and it was obvious something really bad was happening. "Her eyes were just flickering to the side and rolling and she was looking really vacant. She started getting really rigid in her spine. I thought she was having a seizure. "It lasted about three minutes. We were getting ready to go to hospital. Then it happened again in the house. "On the way on the car it started again. She did a scream and I thought she was having a stroke. "I thought she was going to die." AHC is caused by mutations in the ATP1A3 gene. Sufferers experience repeated, though short-lasting, attacks of hemiplegia - paralysis of a portion of the body. This ranges from numbness to full loss of feeling and movement. Attacks or episodes may last for minutes, hours, or even days. Sleep can relieve the symptoms. If the autonomic nervous system - which controls body functions such as breathing or the heartbeat - fails, AHC can cause sudden death. Many more episodes and many tests followed at the Royal Hospital for Sick Children and in February 2018 Katherine and her husband Abhishek learned from genetics results that Anya had the one-in-a-million condition. Mrs Behl explained: "It involves lots of neurological symptoms and some experts describe it as many conditions in one. It is not inherited it is just by chance. "Along with neurological symptoms which can be tremors, weakness, paralysis, eye movements, speech problems, painful rigidity, it causes other non-neurological problems - breathing, heart and developmental problems." Mr Behl says it is sometimes a case of one step forward, two steps back. After each episode, some skills can be lost. Things she has learnt can be lost because of her condition. Mrs Behl said: "Last May, she lost her head control, went floppy like a new born. She had to re-learn that all over again." After spending months just waiting for the next episode to happen, the family decided they had to move on. Mrs Behl said: "You can't live like that waiting for each episode to come so we just try to enjoy each day as it comes and we live in hope each day will go well. Because the condition is so rare, there is little research and treatment. The only drug she takes has so far been unable to stop the episodes. The family are now fundraising to help pay for pre-clinical trials into the condition with the support of several AHC foundations in the US. They hope this could mean a brighter future for their one-in-a-million girl.